"Spartanburg" redirects here. For other uses, see Spartanburg (disambiguation). Spartanburg is the second-largest city in the greater Greenville–Spartanburg–Anderson Combined Statistical Area, which has a population of 1,385,045 as of 2014. It is part of a 10-county region of northwestern South Carolina known as "The Upstate," and is located 98 miles (158 km) northwest of Columbia, 80 miles (130 km) west of Charlotte, North Carolina, and about 190 miles (310 km) northeast of Atlanta, Georgia. Spartanburg is the home of Wofford College and the site of headquarters for Denny's. Spartanburg is also home of the BMW Spartanburg factory. Spartanburg was formed in 1785 and was named after a local militia called the Spartan Regiment in the American Revolutionary War. The Spartan Regiment, commanded by Andrew Pickens, participated in the nearby Battle of Cowpens. In 1831, Spartanburg was incorporated, later becoming known as the "Hub City": railroad lines radiated from the city forming the shape of a wheel hub. It became a center of textile manufacturing in the late 19th century, with around 40 textile mills being established through the early 1900s. During World War I Camp Wadsworth was used to train 100,000 soldiers for the war. Camp Croft trained soldiers during World War II. The facility was transferred to the state and adapted as Croft State Park. By the 1950s, the production in these mills began to decline as wages increased. Most textile manufacturing jobs were moved offshore by the companies. According to the United States Census Bureau, the city has a total area of 19.2 square miles (50 km2), of which 19.1 square miles (49 km2) is land and 0.1 square miles (0.26 km2), or 0.47%, is water. The city of Spartanburg has a humid subtropical climate with long, hot and humid summers, and cool to semi mild winters. The average annual temperature is 61.6 °F (16.4 °C). In the summer season from June through September, average highs are in the 80's to low 90's F, while in the winter months average highs are in the mid 50's F. Annual rainfall is spread fairly evenly throughout the whole year. Spartanburg sees very little snowfall, with the annual average being only 1.4 inches. Average precipitation is 51.3 inches (130 cm) and the average growing season is 231 days. Lawson's Fork Creek, a tributary of the Pacolet River, was once known for its plentiful wildlife and crystal clear waters. Parks and woodlands line much of its banks (which lie entirely within Spartanburg County), and rocky shoals and natural waterfalls can be found throughout its course. It stretches from the northern end of the county to the eastern end, where it empties into the Pacolet. The Cottonwood Trail is a walking trail located in the Edwin M. Griffin Nature Preserve that runs along part of Lawson's Fork Creek. The trail includes picnic areas, a raised path over an extensive wetlands area and access to sporadic sandbars. Located just east of downtown, it is used frequently by cyclists, joggers and walkers. Since the Lawson's Fork floodplain is not suitable for development, wildlife populate the area. Larger animals that can be found here include white-tailed deer, raccoons, wild turkeys, pileated woodpeckers, mallard ducks, Canada geese and snapping turtles. Hatcher Garden and Woodland Preserve, is a preserve located in the midst of an urban environment. Retired social activist Harold Hatcher and his wife Josephine transformed an eroding gully into a thick woods and flower garden which now provides a haven for birds and other wildlife. Early European settlers to this area included French fur trappers, English woodsmen, and Scots-Irish farmers. Few remnants survive from these early pioneering days, but traces can be found in the more rural areas of the county. Walnut Grove Plantation, an 18th-century farmhouse, has been preserved by The Spartanburg County Historical Association. The site of a locally famous skirmish during the American Revolutionary War, it was the home of the Moore family. The plantation lies south of Spartanburg near the town of Roebuck, and is open to the public for tours and during annual festivals. The Seay House, another 18th-century home, is a more typical representative of a pioneer home. Its single stone fireplace and simple construction were common traits of farmsteads from this period. The Price House, the third 18th-century home maintained by the Historical Association, is unique. Its sturdy Flemish-bond brick construction and three stories are less common in this area. By carefully examining the original inventory lists of the house, the Historical Association has been able to retrieve period pieces that approximate the original contents of the house. First established in the 1780s as a courthouse village, Spartanburg may have been named for the Spartan regiment of the South Carolina militia. The city was incorporated in 1831, at the time of the 50th anniversary of the Battle of Cowpens, a pivotal fight of the American Revolution that took place only a few miles away. The city's streets and architectural record reflect the changes of the 19th and 20th centuries. Morgan Square, the city's primary downtown hub, is the original courthouse village. It was founded adjacent to a small spring (now underground) on the western slope of a ridge, which forms the border of the Tyger and Pacolet River watersheds. The square's name derives from Daniel Morgan, the general who commanded the American forces at Cowpens. A statue of Morgan was placed in the square in 1881. The oldest existing buildings on Morgan Square date to the 1880s. The Magnolia Street Train Depot is one of the older buildings in Spartanburg and stands as a reminder of Spartanburg's old nickname "the Hub City," referring to the many transportation routes that connected Spartanburg with cities throughout the region. It is now the home of the Amtrak station, the Hub City Railroad Museum, and the Hub City Farmers' Market. Hampton Heights Historic District is the city's oldest intact downtown neighborhood, located a couple of blocks south of Morgan Square. Architectural styles in this neighborhood range from large Queen Anne and Neoclassical homes to cozy early 20th-century bungalows. Cotton mills have abounded in the Spartanburg area since 1816, earning Spartanburg the reputation as the "Lowell of the South." Although there were few mills in the area before the Civil War, technological advances, northern capital, and out-migration from the poor farms that made white labor available, created a wave of postbellum mill development here and in much of the Piedmont South. Additionally, the abundant streams and rivers in the area are just beginning their descent towards the lower-lying Midlands region. In many places, these waterways descend abruptly, providing a source for plentiful waterpower. Cotton mills were built along these rivers to harness this power, and so began the region's servitude to King Cotton. These mills, their owners and their laborers dominated the politics and economy of the region for nearly a century. Although nearly all abandoned, many mills remain along the riverbanks, the Piedmont equivalent of Gothic ruins. Glendale Mill is located off Lawson's Fork Creek southeast of the city. Although gutted by fire in 2004, a few towers and smokestacks remain, providing a dramatic backdrop to the dam, shoals and waterfalls of the creek below. The former company store now serves as the home of the Wofford College Environmental Studies Center. The Glendale Shoals bridge will be getting a $600,000 makeover, and will ultimately connect to the state's Palmetto Trail. Beaumont Mill,north of the downtown, has recently been purchased by Spartanburg Regional Healthcare who moved their billing, human resources, and medical records to the 180,000 square foot mill. The adjacent mill village has been designated as a local historic district. Converse Mill is located east of the city along the Pacolet River. It has recently been purchased by a developer. The mill was reconstructed in 1903 after a huge flood washed away the original mill. The dam is still in use by Converse Energy Inc as a hydroelectric plant. When the United States entered World War I in 1917, one of the sixteen divisional cantonments for the training of National Guard troops was Camp Wadsworth, which is located in the vicinity of Westgate Mall. Large numbers of New York National Guardsmen trained there in addition to many southern troops. During World War II, Camp Croft south of the city trained Army recruits. This is now a South Carolina state park with the same name. Some portions of the park contain the original quonset huts. The current mayor, Junie White, was elected in 2009. Spartanburg operates under a city manager form of government in which the mayor and six city council members have equal votes. Council members represent districts within the city and the mayor is elected at large. The council appoints a city manager, who is responsible for the daily administration of city governmental affairs. City Hall is located at 145 West Broad Street. The Spartanburg County Administration Building (this is the old Sears building which was vacated in the mid-1970s when Sears moved to Westgate Mall and renovated in the late 1980s or early 1990s) is located at 366 North Church Street. It is across the street from the Spartanburg Memorial Auditorium. Within the past decade, developers and community leaders have spearheaded an effort to revitalize Spartanburg's downtown commercial district. This has resulted in a remodeling of Morgan Square, the restoration of a number of historic structures and the relocation of several businesses and company headquarters to the downtown vicinity. Some of these new developments include a nine-floor, 240-room Marriott. .
Spartanburg is home to many large companies including Denny's, QS/1 Data Systems, Advance America Cash Advance, Southern Conference, Spartanburg Herald-Journal, RJ Rockers Brewing Company, American Credit Acceptance, and Upward Sports. The economy of both Greenville, South Carolina and Spartanburg benefit from the BMW manufacturing facility located in the city of Greer, South Carolina. As of February 2017, the plant employs around 8,800 people with an average daily output of about 1,400 vehicles. Spartanburg is also home to the world headquarters and research facility for Milliken & Company, a textile and chemical manufacturer. USC Upstate's Johnson College of Business and Economics downtown. The University of South Carolina Upstate (formerly known as University of South Carolina Spartanburg, or USCS). Converse College – Founded in 1889, Converse is a comprehensive masters institution with a co-ed graduate school and an undergraduate women's liberal arts college. Spartanburg Methodist College – The only 2-year, private, residential college in the state. Edward Via College of Osteopathic Medicine (VCOM) – Carolinas Campus. First classes began in Fall 2011. Wofford College – Founded in 1854, Wofford is a Phi Beta Kappa liberal arts college with an enrollment of approximately 1,500 students. Most of the City of Spartanburg's public schools are run by Spartanburg County School District 7, one of seven loosely affiliated districts located in Spartanburg County. However, the westernmost part of the city is served by Spartanburg County School District 6, which has two elementary schools within city limits. Spartanburg is home to the main campus of the South Carolina School for the Deaf and Blind. It has five Regional Outreach Centers throughout the state. The city is also home to Spartanburg Preparatory School, a K-8 public charter school that is the only "brick and mortar" charter school in the Upstate. Spartanburg is also home to Spartanburg Christian Academy, a K-12 private school in North Spartanburg, the Spartanburg Day School, a K-12 private school offering the International Baccalaureate in grades K-4, and to Oakbrook Preparatory and Westgate Christian schools, both K-12 private schools. Located in Hampton Heights, the Montessori Academy of Spartanburg is a PreK-8 private school providing a Montessori educational approach. The Meeting Street Academy in downtown Spartanburg is a branch of a Charleston-based private school and currently offers PreK and Kindergarten. St. Paul the Apostle Catholic School is located in downtown Spartanburg. It is affiliated with the Diocese of Charleston and is K-8. Spartanburg Medical Center (SMC), a research and teaching hospital with two locations: Spartanburg Medical Center campus on East Wood Street and Spartanburg Medical Center — Mary Black Campus on Skylyn Drive. Together, these campuses share a history that stretches back to the 1920s. Spartanburg Medical Center includes a total of 747 beds, and services that include emergency, surgical, maternity, cancer, a Heart Center and inpatient rehabilitation. Spartanburg Hospital for Restorative Care (SHRC), a 97-bed long-term, acute-care hospital with a 25-bed skilled nursing facility. The Hub City Farmers' Market, an outdoor market held Saturday mornings from 6:00am – 12:00pm during the summer and fall on the grounds of the historic Magnolia Street Train Station, showcasing local (often organic) produce and goods. Retrofest, the Southeast's largest disco festival held at Spartanburg Memorial Auditorium on the first Saturday in February. Spring Fling, a weekend festival typically held the first Saturday of May, has many live artists, rides, and other assorted attractions. Red, White and Boom, a Fourth of July event held at Barnet Park featuring patriotic music and a fireworks display. The Annual Sidewalk Arts Show, an open, juried art exhibition held concurrently with The International Festival on the first Saturday in October. The International Festival, an event showcasing culture and cuisine from countries around the globe held at Barnet Park on the first Saturday in October. Music on Main, a street concert event held every Thursday (April through August) downtown. The Greek Festival, a major street festival that is held in September by the local Greek community at St. Nicholas Greek Orthodox Church. It offers Greek food and cultural activities, and is the sister festival to the Greek Festival held every spring in Greenville. Dickens of a Christmas, a Victorian holiday event held annually in downtown Spartanburg on the Tuesday after Thanksgiving. Festifall, an historical celebration held on the grounds of the 18th-century Walnut Grove Plantation in October, featuring demonstrations and reenactments. Taste of the Backcountry, a historical celebration held on the grounds of the 18th-century Price House in April, featuring food samples and demonstrations. The Hub City Hog Fest is an annual barbecue festival and competition that benefits Mobile Meals. It is held in the heart of downtown Spartanburg with food trucks, over 40 BBQ teams, and two days of live music. Ballet Spartanburg which has hosted over 22 national and international ballet companies. Spartanburg Music Trail which is a series of signs throughout downtown recognizing local musicians. Several golf courses, including two private 18-hole courses at the Country Club of Spartanburg and the Carolina Country Club. Ground Zero historic live music venue. The Beacon Drive-In (Since 1946). Quarterback Cam Newton and the Carolina Panthers participate in training camp at Wofford College in 2011. 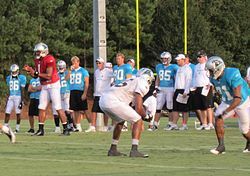 Spartanburg is host to the NFL's Carolina Panthers training camp each year on the campus of Wofford College. Historic Duncan Park Stadium was once home to the Spartanburg Stingers in the Coastal Plain League and the Spartanburg Crickets in the Southern Collegiate Baseball League and is the oldest minor league baseball stadium in the country. It was also once home to the Spartanburg Phillies, a minor league team of the Philadelphia Phillies. It now is the home stadium for the baseball teams of Spartanburg High School. The Shrine Bowl of the Carolinas is held each year at Wofford's Gibbs Stadium. It is a high school football all-star game played between the top players from South Carolina and the top players from North Carolina. The USC Upstate Spartans, Spartanburg Methodist College Pioneers, and the Wofford College Terriers offer a variety of sports for both men and women. Converse College also offers NCAA Division II women's sports teams. Spartanburg is located an hour away from the Clemson Tigers and about an hour and a half away from the University of South Carolina Gamecocks. Upward Sports, a Christian-based sports organization for kids, is headquartered in Spartanburg. The Chapman Cultural Center, Spartanburg's cultural anchor for history, art, theatre, dance, music, and science, is located in a three-building complex on the northern edge of downtown. Opened in October 2007, the Center was designed by David M. Schwarz Architects of Washington, D.C. It houses the Spartanburg Art Museum, Spartanburg County Regional History Museum, Science Center, Little Theatre, Ballet, Music Foundation, and other groups that were formerly located in The Arts Center on South Spring Street. It is owned and operated by The Arts Partnership of Greater Spartanburg, a non-profit organization dedicated to supporting arts and cultural agencies in Spartanburg County. The Showroom, the home of Hub-Bub, is a new center for progressive arts in the community. It houses a gallery, film screen, stage, and concert venue and is home to a nationally recognized artist residency program. Hub-Bub is the creative effort responsible for the founding of The Showroom and, as a project goal, seeks to attract and retain creative talent in the community. It was launched in March 2005 by the Hub City Writers Project with assistance from private donors and the city of Spartanburg. The Hub City Writers Project, located a block away, serves the community as a local publishing company and independent bookstore. The Showroom also housed the first TEDx Spartanburg event on September 10, 2011. Converse College is a nationally known four-year liberal arts institution recognized for its strong music and visual art programs. It hosts events open to the community throughout the year. Twichell Auditorium is located on the campus of Converse College. Home of the Greater Spartanburg Philharmonic Orchestra, Twichell Auditorium has served as hosts to other groups such as the Spartanburg All-County High School Band and Boston Brass. Twichell Auditorium was built in 1899 and renovated for the school's centennial celebration in 1989. The 1500-seat auditorium is home to a 57-rank Casavant organ with 2,600+ pipes. Theatre Converse puts on several plays a year, and Converse puts on an opera annually, as well as opera scenes. The college has had major concerts in recent years with such artists as Caedmon's Call, Jason Mraz, Corey Smith, and Colbie Caillat. Wofford College is a liberal arts college. Not traditionally known for its arts and cultural strength, Wofford has made notable strides to develop arts programs in recent years. Poet and environmental writer John E. Lane, theater artist Mark Ferguson, and visual artist Kris Neely are all graduates of Wofford. Each returned to their alma mater to develop curricular and co-curricular opportunities in the Arts, including a Creative Writing program, a Theatre Major, and a minor in Studio Art. John Lane was also a critical visionary in the creation of the Goodall Environmental Studies Center in Glendale, SC. 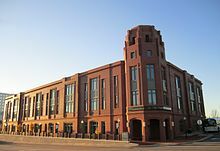 The Spartanburg County Public Library headquarters, housed in an innovative building on South Church Street, is home to a voluminous collection of fiction, nonfiction, children's literature, A/V materials and items relating to local history and genealogy. The library hosts many meetings, concerts and presentations. The Spartanburg Memorial Auditorium is located on N. Church Street, across from the municipal building in the northwest end of the city of Spartanburg. The "SMA" has hosted acts such as Bob Dylan, Crosby Stills and Nash, B.B. King, Billy Joel, David Copperfield, Lewis Grizzard, Harry Connick, Jr., Gerald Levert, Dave Chappelle, Jerry Seinfeld, Phish, A Prairie Home Companion, and many others. Originally built in an Art Deco style and was renovated c. 2002 including a new facade and backstage with loading area. Spartanburg's primary newspaper is the Spartanburg Herald-Journal, a member of the Halifax Media Group. The Spartanburg Journal is a weekly newspaper that is part of a Community Journal group that also has editions in Greenville and Anderson. The Spartan Weekly News is a weekly newspaper with offices located in downtown Spartanburg. The paper covers all of Spartanburg County with an emphasis on the city of Spartanburg, and its coverage focuses on items of community interest and well as news from around the upstate of South Carolina. The award-winning Hometown News Group has several newspapers throughout the county and upstate region: The Boiling Springs Sentry, The Blacksburg Times, The Inman Times, Spartanburg County News, The Chesnee Tribune, The Middle Tyger Times, The Whitmire News, The Woodruff News, and The Greer Citizen. Aside from local news and sports coverage, the newspapers offer free wedding and social announcements. All of these papers, save "The Greer Citizen" ceased publication at the end of 2012. Upstate Link magazine is a young reader (20s–30s) newsweekly in the Upstate of South Carolina, which includes Greenville, Spartanburg and Anderson. The weekly publication began in January 2004. Link continues to be a print publication, but its website ceased operation in 2008. Its new website is run by Chicago-based Metromix. A hybrid SPARTA bus at the downtown Passenger Center. Spartanburg is served by the Spartanburg Area Regional Transit Agency (SPARTA), covering the city of Spartanburg and the surrounding urbanized area with 8 routes leading to a wide variety of destinations. All SPARTA buses are equipped with bicycle racks. Two hybrid-electric buses were added to the fleet in 2012. The SPARTA Passenger Center is located at 100 North Liberty Street and also serves Greyhound buses. Mass Transit is provided to all citizens of Spartanburg County through Spartanburg County Dial-A-Ride. It is a door to door service that operates six days a week. The Greenville-Spartanburg International Airport (GSP) lies mostly in suburban Greer, and it serves Greenville as well as Spartanburg. It has become one of the busiest airports in South Carolina. The Spartanburg Downtown Memorial Airport (SPA) is a general aviation/small craft airport owned and operated by the City, which lies southwest of town. Amtrak's Crescent train connects Spartanburg with the cities of New York, Philadelphia, Baltimore, Washington, Greensboro, Charlotte, Atlanta, Birmingham and New Orleans. The Amtrak station is situated at 290 Magnolia Street. As of the census of 2010, there were 37,013 people, 15,989 households, and 9,721 families residing in the city. The population density was 2,066.3 people per square mile (799.9/km²). There were 17,696 housing units at an average density of 923.9 per square mile (356.8/km²). The racial makeup was 49.55% African American, 47.15% White, 0.18% Native American, 1.33% Asian, 0.06% Pacific Islander, 0.76% from other races, and 0.96% from two or more races. Hispanic or Latino of any race were 1.78% of the population. There were 15,989 households out of which 28.9% had children under the age of 18 living with them, 34.0% were married couples living together, 23.0% had a female householder with no husband present, and 39.2% were non-families. 34.0% of all households were made up of individuals and 13.2% had someone living alone who was 65 years of age or older. The average household size was 2.33 and the average family size was 3.00. In the city, the population was spread out with 25.2% under the age of 18, 12.2% from 18 to 24, 26.6% from 25 to 44, 20.6% from 45 to 64, and 15.4% who were 65 years of age or older. The median age was 35 years. For every 100 females, there were 79.6 males. The median income for a household in the city was $28,735, and the median income for a family was $36,108. Males had a median income of $30,587 versus $23,256 for females. The per capita income for the city was $18,136. About 29.4% of families and 23.3% of the population were below the poverty line, including 34.6% of those under age 18 and 15.4% of those age 65 or over. Norman C. Armitage (1907, as Norman Cudworth Cohn–1972), Olympic medalist saber fencer who lived in Spartanburg, S. C., and in honor of whom the Milliken company plant in Spartanburg County was named. Joe Bennett, lead singer and guitarist from the 1950s rock 'n roll band "Joe Bennett and the Sparkletones"
Ted Bogan (1909–1990), country blues guitarist, singer and songwriter. William "Singing Billy" Walker (1809–1875), compiler of shape note tunebooks, including The Southern Harmony, and Musical Companion. ^ "SCPL Historical Digital Collections". Spartanburg County Public Libraries. Retrieved October 15, 2018. ^ "Annual Estimates of the Resident Population for Incorporated Places: April 1, 2010 to July 1, 2013". 2013 Population Estimates. U.S. Census Bureau, Population Division. June 3, 2014. Retrieved June 3, 2014. ^ USA. EXECUTIVE OFFICE OF THE PRESIDENT. OFFICE OF MANAGEMENT AND BUDGET. February 28, 2013. Comp. Jeffrey D. Zients. 01st ed. Vol. 13. Washington, DC: US GOV, 2013. OMB Bulletin. EXECUTIVE DEPARTMENTS AND ESTABLISHMENTS. Web. January 19, 2013. . Lists of Metropolitan Statistical Areas, Metropolitan Divisions, Micropolitan Statistical Areas, Combined Statistical Areas, and New England City and Town Area Delineations: This bulletin and its appendix that provides the nine lists of statistical areas are available electronically from the OMB website at http://www.whitehouse.gov/omb – under "Bulletins;" of note, this update, historical delineations, and other information about population statistics is available on the Census Bureau's website at: https://www.census.gov/populationimetro. ^ "2010-2014 American Community Survey 5-Year Estimates". American Fact Finder. United States Census Bureau. Retrieved September 7, 2016. ^ Spartanburg Area Conservancy – Edwin M. Griffin Nature Preserve. Spartanburgconservation.org. Retrieved on December 12, 2010. ^ Spartanburg, City and County, South Carolina. Spartanburg Board of Trade. 1888. p. 5. ^ "Glendale Mill - Glendale South Carolina SC". Sciway.net. Retrieved September 8, 2016. ^ Doughman, Andrew. 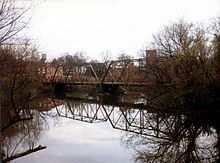 "Glendale Shoals bridge to receive $600,000 makeover". Spartanburg Herald-Journal. Retrieved September 8, 2016. ^ "Former Textile Mill Once Again Buzzes with Activity". Wyff4.com. Retrieved September 8, 2016. ^ Beaumont Village Local Historic District. Cityofspartanburg.org. Retrieved on January 29, 2012. ^ City Council. City of Spartanburg. Retrieved on December 12, 2010. ^ "City of Spartanburg CAFR" (PDF). Retrieved January 10, 2016. ^ Education Corporation of America. "Spartanburg, SC Career College – Virginia College". vc.edu. ^ South Carolina School for the Deaf and the Blind. Scsdb.org. Retrieved on December 12, 2010. ^ "Spartanburg Preparatory School". Spartanburg Preparatory School. Retrieved June 3, 2014. ^ Spartanburg Christian Academy. Scawarriors.org (December 6, 2010). Retrieved on December 12, 2010. ^ Oakbrook Preparatory School. Oakbrookprep.org. Retrieved on December 12, 2010. ^ Montessori Academy of Spartanburg. montessorispartanburg.com. Retrieved on June 7, 2014. ^ Meeting Street Academy – Spartanburg. meetingstreetacademy.com. Retrieved on June 7, 2014. ^ St Paul the Apostle Catholic School Spartanburg SC. Stpaulschoolsc.com. Retrieved on December 12, 2010. ^ "Cancer Treatment at Gibbs Cancer Center - Spartanburg Regional Healthcare System". www.spartanburgregional.com. Retrieved January 15, 2019. ^ "Bearden-Josey Center for Breast Health - Spartanburg Regional Healthcare System". www.spartanburgregional.com. Retrieved January 15, 2019. ^ "About Spartanburg Regional - Spartanburg Regional Healthcare System". www.spartanburgregional.com. Retrieved January 15, 2019. ^ "The Spartanburg Museum of Art". Spartanburgartmuseum.org. Retrieved September 1, 2011. 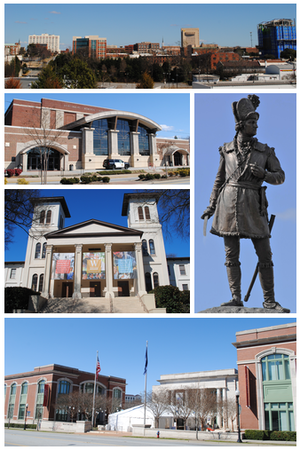 ^ "The Spartanburg Regional Museum of History". Spartanburghistory.org. March 22, 2011. Retrieved September 1, 2011. ^ "The Spartanburg Science Center". The Spartanburg Science Center. Retrieved September 1, 2011. ^ "Ballet Spartanburg". Sparklenet.com. Retrieved September 1, 2011. ^ "Hub City Railroad Museum". Retrieved July 20, 2012. ^ "Spartanburg Music Trail". Retrieved July 20, 2012. ^ "Spartanburg Stingers". Spartanburg Stingers. Retrieved September 1, 2011. ^ "Southern Collegiate Baseball League – Home Page – Pointstreak Sites". Scbl.org. ^ "Home Page | Southern Collegiate Baseball League". Scbl.org. July 19, 2015. Retrieved November 8, 2016. ^ Athletics | Converse College. Converse.edu. Retrieved on December 12, 2010. ^ Upward Sports – Providing the best sports experience for every child. Upward.org. Retrieved on December 12, 2010. ^ Welcome to the Chapman Cultural Center. Chapmanculturalcenter.org. Retrieved on December 12, 2010. ^ Welcome to the Chapman Cultural Center. Spartanarts.org. Retrieved on December 12, 2010. ^ Hub-Bub.com. Hub-Bub.com. Retrieved on December 12, 2010. ^ Welcome to. Hubcity.org. Retrieved on December 12, 2010. ^ TEDxSpartanburg – Together: Creating A New Vision. TEDxSpartanburg.com. Retrieved on February 4, 2012. ^ Converse College. Converse.edu. Retrieved on December 12, 2010. ^ Wofford College. Wofford.edu (October 22, 2007). Retrieved on December 12, 2010. ^ Spartanburg County Public Libraries. Infodepot.org. Retrieved on December 12, 2010. ^ "About". Facecampusequality.org. Retrieved November 8, 2016. ^ "GoUpstate.com". GoUpstate.com. Retrieved April 13, 2012. ^ Do you think the TSA has gone too far with security checks?. Hometown News. Retrieved on December 12, 2010. ^ "Chicago Entertainment, Events & Restaurants – Metromix Chicago". metromix.com. ^ Trevor Anderson (June 30, 2013). "Spartanburg City Council OKs first reading of $33.4M budget - News - GoUpstate - Spartanburg, SC". GoUpstate.com. Retrieved November 8, 2016. ^ "Airport". Web.archive.org. April 29, 2006. Retrieved December 12, 2018. ^ "Census of Population and Housing". United States Census Bureau. Retrieved August 14, 2013. ^ "Ted Alexander". Baseball-Reference.com. Retrieved November 10, 2012. ^ Eugene Chadbourne. "Ted Bogan | Biography & History". AllMusic. Retrieved November 8, 2016. ^ "Truman Cerney Eagle Scout letters US President Youngest Eagle Scout US History". Academia.edu. Retrieved December 12, 2018. ^ "Stephen Lamont Davis". Pro-Football-Reference.Com. Retrieved November 10, 2012. ^ "Art Fowler Stats". Baseball Almanac. Retrieved November 10, 2012. ^ "Lowery Featured Speaker for Oklahoma Baptist University Chapel Service, February 14, 2000". okbu.edu. Retrieved June 16, 2012.
Cooper, Peter (1997). Hub City Music Makers. Spartanburg, S.C.: Holocene Publishing. ISBN 0-9638731-9-9. Landrum, J.B.O. (1900). History of Spartanburg County. Racine, Philip N. (1999). Seeing Spartanburg. Spartanburg, S.C.: Hub City Writers Project. ISBN 1-891885-10-3. Teter, Betsy Wakefield (Ed.) (2002). Textile Town: Spartanburg, South Carolina. Spartanburg, S.C.: Hub City Writers Project. ISBN 1-891885-28-6. Pp. 346. 40 authors provide a detailed community study, using oral histories, letters, and 200 illustrations and photographs. Central themes include labor strikes, family life in the mill villages, Depression-era hardships, race and desegregation, the boom of WW2 production, and late-twentieth-century deindustrialization. WPA (1939). History of Spartanburg County. Wikimedia Commons has media related to Spartanburg, South Carolina. Wikivoyage has a travel guide for Spartanburg. "Spartanburg" . New International Encyclopedia. 1905. "Spartanburg, S. C." . The New Student's Reference Work . 1914.